Stainless Steel Cable Ties are recommended for applications when added resistance to corrosion, chemical and weathering effects is required. They work effectively under the most extreme temperatures and severe environmental conditions. Applications for stainless steel cable ties are found in general industry, utilities, construction, automotive, the petroleum and chemical industry, fire protection, communication, aerospace, and nuclear. 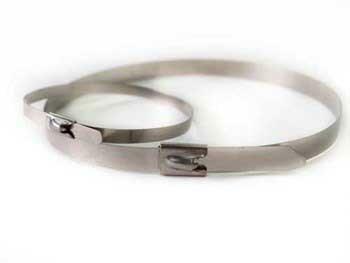 Stainless Steel Cable Ties are available in stainless steel grades 304 and 316. A non-toxic halogen free polyester coating in a variety of colors is also available in the Stainless Steel Cable Tie offering when an even greater degree of resistance is required. There are three types of stainless steel cable ties – Roller Ball, Ladder, and Releasable. The most popular design is the Roller Ball Stainless Steel Cable Tie. An internal locking ball is found within the head of the tie which provides the locking mechanism for cinching. Stainless Steel Cable Ties have a 150 and 300 lb tensile strength. The ties are packaged in quantities of 100 pieces per bag.